is designed to teach young players between the ages of three and eight the fundamentals of hockey and provide them with the basic skills they require to begin their hockey careers. Headstart Hockey realizes the importance of teaching players at this young age and aims to give them the proper skills and knowledge to succeed throughout their hockey careers. Each and every instructor has a background in teaching players of this ag e group and are certified Canadian Hockey Initiation Program (CHIP) Instructors. In the winter all of the instructors are involved in the Whitby Minor Hockeys development program, Ajax Minor Hockey development, Oshawa Church Hockey League, Oshawa Lady Generals, and more! 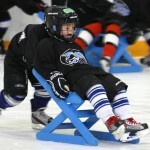 Participating in any Headstart Hockey program will teach a player proper skating techniques, stride power, how to handle the puck, among other important skills. Ultimately, our goal is for each player to learn the skills needed all while having fun playing a game everyone in Canada knows and loves. The Headstart Hockey program has camps and sessions running all year round so please check back often for camp details as they are posted. We now offer Summer Camps, Fall Sessions, X-Mas Sessions, Winter Sessions, March Break Sessions, Pre-Tryout camps, All Day Summer Camp Weeks. and Headstart Hockey spring tournament teams. We teach kids of all skill ranges from new skaters to rep level players. What makes Headstart Hockey stand out from other hockey schools and camps in the area is our target market. Our Hockey camps are specifically tailored to meet the needs of this young age group, and the constant yearly demand for our program speaks for itself.